Many of us are going through various difficulties. For some, the challenges are healthwise; for others, they are economic, romantic, etc. Today, I want to focus on economic challenges. We may be finding it hard to pay the bills and generally take care of ourselves. We may even be in the embarrassing situation of not being able to respond to crucial needs in the lives of family nembers like contributing to tuition, weddings and funerals. We stay away from social and church functions, not because we’re anti-social or lukewarm, but because we cannot meet up with any associated monetary demands. But the irony is often that what we are going through may be a far cry from what God is speaking to us about our lives. I remember a sister whose husband was seriously injured in an accident. The doctors weren’t sure he would walk again. His treatment was costing so much and the kids were in school. The sister, who was a poorly paid teacher in a secondary school at the time, had to devise other means to make ends meet. She began to sew clothes for people after work. Meanwhile, in the midst of these trying times, she was having a recurrent dream of herself driving an expensive new car. Now, that type of dream can get somebody angry. Perhaps, you’re having a similar experience. This reminds me of David in the Bible. He was anointed to replace Saul as king of Israel but for thirteen years, Saul hunted him to kill him. Within that time, David lived in caves, in the desert and as a refugee (1 Samuel, chapters 16-30). 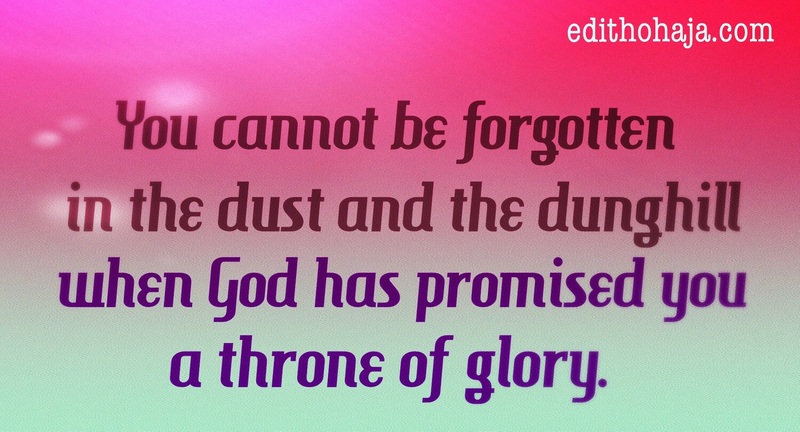 A man whom God had promised the palace! He wandered from place to place, never feeling safe till he left Israel. On one occasion, he sent his men to beg food from Nabal, a wealthy farmer who was having his sheep shearing feast, and they were roundly insulted (1 Samuel 25:4-11). But if you know anything about God, you know how the story ends. David eventually acceded to the throne and ruled over all Israel as God had promised him (2 Samuel 5:1-5). And the sister who was moonlighting as a tailor had a complete turnaround some years down the line. Her husband recovered perfectly, she landed a better job that made the tailoring unnecessary and she got the luxury car she was dreaming of. Apply this to yourself no matter how hard things are presently. Don’t disregard the things God is telling you now because they seem so improbable. Believe and write them down. Thank God for them often. Receive comfort from those words, humbly follow whatever steps God will have you take and know that at the appointed time, His promises shall become your reality. Put your name in place of the “she” in the verse above. And may God strengthen your heart as you believe Him in Jesus’ name. If God is not speaking to you, perhaps because you’re not born again, take a moment to pray this prayer and make peace with Him. Almighty God, I repent of my sins and ask you to forgive me. I receive the work Jesus did for me by shedding His blood for my sins. Write my name in the Lamb’s Book of Life, send your Spirit to live in my heart and teach me your word. I receive the grace to live a life that honours you henceforth in Jesus’ name. Anen. Join a Bible-believing church/fellowship and expect God to respond when you talk to Him in prayer. He can do this directly in your heart; through the Bible or through inspired words from other believers, books, CDs, etc. Beautiful encouragement, Edith. Love the story line, too! Blessings to you. Bless you much, much, Shira, for always being an encouragement to be too. ? Thank you so much aunt Edith. Today, many people think skills are unimportant because of what God has promised them but I'm glad that this story has pinpointed the importance of skill acquisition once again. God's blessings cannot be felt when one can't do anything besides faith without work is dead. Thank you once again, Aunt Edith. His word is indeed Ye and Amen. Lovely comment, dear Chiemela. You are superbly blessed if the Lord in Jesus' name. And bless you too, Ramona! ? Amen. Well said, JC. Be superbly blessed in Jesus' name. Praise God! You need to build your language in terms of vocabulary, grammar, etc. Then have something you want to say. Reading widely helps to fill your mind with ideas. Then for me, my relationship with God, prayer and meditating on the Bible bring inspiration. These are just the basics. Hope you find them helpful. Bless you, Chinyere! May this be a prophecy in our lives that will soon find fulfilment in Jesus' name. These are just the words I needed to hear today. Thank you Aunty Edith for your kind words of encouragement. Awwww, Ami, so glad you dropped by. You're a winner all the time in Jesus' name. Why the words of God is more efficacious than the ordinary novel which we read is that it is new each time is is read or shared by somebody else. It restores the broken-hearted and lifts the downcast. It is inspiring, encouraging and thought-provoking.I will definitely share my testimony (ies) through this blog, I know and I'm sure that God will do it for me. Thank you ma. AMEN to that, Benjamin! The Lord hears us and He answers. Your testimonies will reach you in Jesus' name. You too, Angela. Praise God! This post is encouraging. i love it. It shows that God never fails,He nevre foresakes, He is always faithful no matter what. At the appointed time, God's promises shall become reality. It is reassuring I must say. But many have failed to cling to this declaration and they end up taking impulsive decision. This piece reminds me of an editorial I read in one of the national dailies, The New Telegraph. It dealt with the rising suicide cases occasioned by the economic recession in the country. There were instances of men who took their lives because they could not afford to put food on the table.Some could not pay their debts and the last option was to end their lives. When I read the editorial, I had enormous pity on them. So, it depends on one's level of understanding of God's promises and his ability to answer prayers. Yes, it does! A bad situation can turn around in the best future or even suddenly but the person who commits suicide won't be around to find out. Thank you too! You are highly blessed in Jesus' name. Amen. And thank you for the encouragement. You are lifted in Jesus' name. Encouraging piece... Reminds me of the biblical saying that "sorrows endure only for a night, but joy comes in the morning". Faith and hope in the Almighty is all we need to Enjoy that "joyful morning..."
Very true. Thanks a lot, Collins! May you see the faithfulness of God in your endeavours in Jesus' name. Indeed! This story of David is a wonderful help to me because am also finding it hard believing such annoying dreams in the midst of agonizing situations in my life. thank you so much Ma. Thank you too, my dear! Bear in mind that God will make all things beautiful in their time. Cheers! inspirational, our plans and Gods plans for us are different so as Christian we should let God be in control. no matter the situation we find ourselves in, we should just trust in him. That is our portion in Jesus' name. Amen and Amen. May He bless you more, beloved, in Jesus' name. It's all by His grace. Hallelujah! This post is very motivational. Motivates us to wait for God's time for his is the best. Also encourages us to have faith in him. God knows all of our struggles and He will address all of them in due time. All we have to do is believe. Ma, have i ever told you that you are gifted? Well you are and an amazing person too. Thanks for encouraging and reassuring me with you posts. God has me in His palms-i know i'm safe.